Two visits again this week! 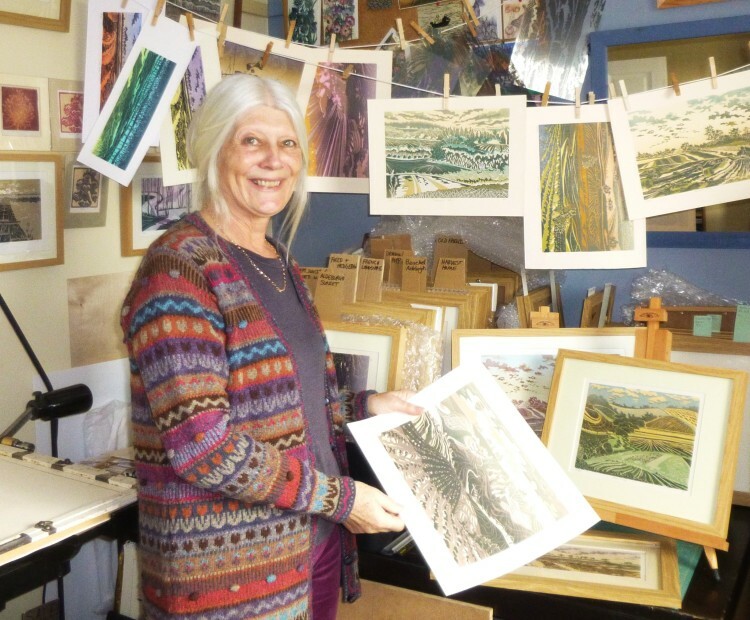 On Thursday, a lovely sunny spring morning, I drove out to Wissington, near Nayland, to visit printmaker, Anne Townshend. Anne’s linocuts show fields, hedges, man-made marks on the natural landscape. Her home, at 1, Blacksmith’s Cottages, is in a lovely rural area, and faces south over the water meadows of the River Stour on the Essex/Suffolk border. It was easy to see where her inspiration comes from! Anne told me she often goes out into the neighbouring fields, and sits drawing for hours – and having discovered this lovely area, to which I had never been before, I intend to do the same when the weather is a bit warmer! Anne uses a room at the front of her house as a studio, and there was her big press, and lots of prints hung up to dry with clothes pegs. I am sure her work is going to be very popular with Festival goers. In the photo below, taken in her studio, Anne is wearing a cardigan by another artist-maker whose work we are showing this year – knitwear designer and maker, Caroline Sullivan! What a coincidence! Yesterday I was off to the Suffolk/Norfolk border – this time to visit Helen Howes at her studio/gallery/shop at the Raveningham Centre. 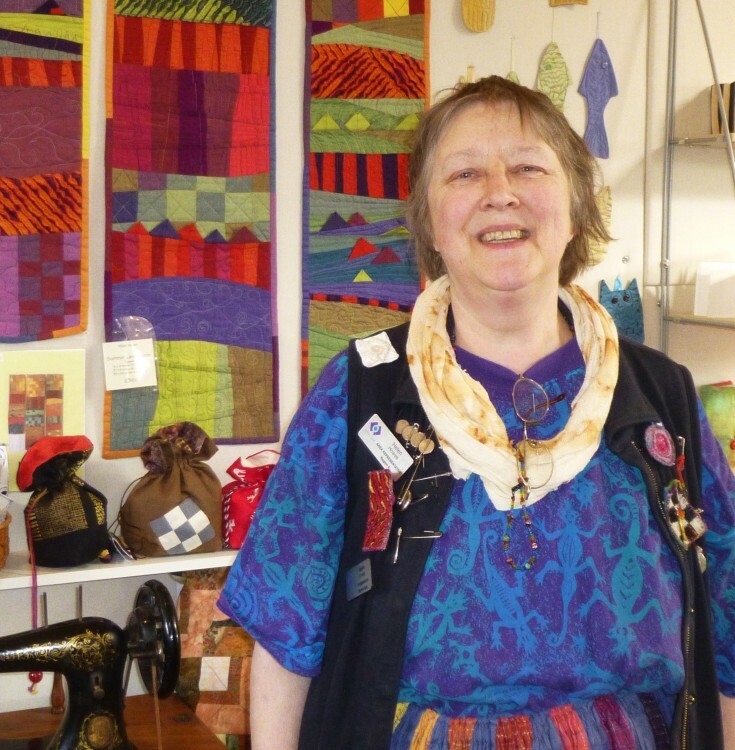 Helen is a textile artist who uses an enormous variety of techniques to produce wonderful hangings, and numerous smaller items. Huge colourful quilts hung from the rafters of her unit – and she showed me small exquisite pieces made from tiny pieces of silk with textured, hand-dyed stitching – and zipped silk purses, and screen printed, and collaged items . . . . her work disply at the Festival is going to be so colourful and interesting! I also had a second visit to the Royal Academy’s ‘Painting the Modern Garden’ exhibition this week, this time with my niece. It was so good to see my favourites again, and we spent a long time just looking at Monet’s water-lily triptych, in the last room. What an awesome work!